Adjusting to the demands of the professional game has been an easy transition for Connor Law. Allowing just four earned runs, and maintaining an impressive 0.99 WHIP in his 28 1/3 innings was an impressive start. Finding success with his three pitch mix; Law uses a 4-seam fastball, changeup, and slider in his repertoire. Staying ahead in counts by challenging hitters high in the zone with his 4-seam fastball, Law discusses how he uses his heater to his advantage every outing. Achieving what he wanted during his first professional season, Law looks back on his 2017 season with fond admiration. 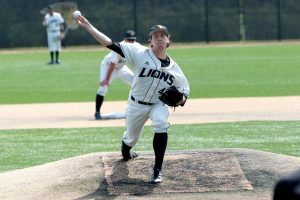 Preparing for professional baseball, as a student athlete at Lindenwood University in Missouri; Law describes the differences between playing college and pro ball. Focused on improving every aspect of his conditioning this off-season, Law has returned home to work on his mechanics, diet, and helping local kids improve their game. With all of the dedication that Connor Law puts into his craft, fans of the Toronto Blue Jays will definitely be following his development for years to come.